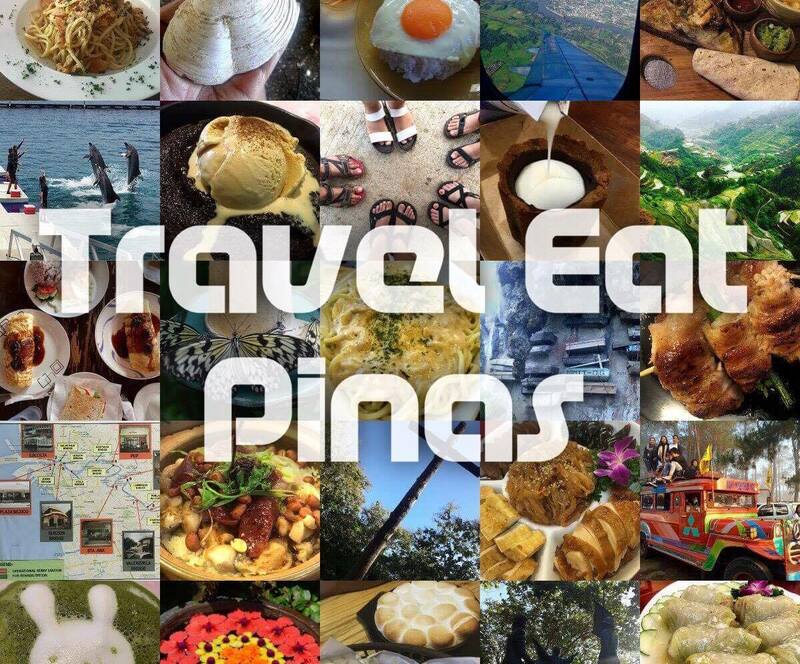 Home / food / Food that are healthy / GO SALADS / Healthy / Healthy Restaurant in Manila / Organic food / travel eat pinas / TrEaPh / where to buy healthy food in manila / Stay Fit and Healthy with GO SALADS! Stay Fit and Healthy with GO SALADS! They say in order for you to lose weight you should follow the 70:30 ratio or 70% diet and 30% exercise. Diet or eating healthy and in moderation is still the key in order to achieve the body we've always wanted. That is why whenever I plan to loose a couple or more pounds, I eat healthy and my healthy to go place is GO SALADS. I listed the five things that makes Go Salads my healthy companion. 1. Healthy- Go Salads menu has healthy items that is mostly composed of fruits, vegetables, chicken and tuna meat. Smoothies and salads are more of fruits and vegetable which are full of vitamins and minerals that is essential for our body. Aside from vegetable and fruits, they also have nuts that is good for the heart because of it's heart healthy omega-3. Chicken meat on the other hand is rich in protein that our body need specially when we are exercising. 2. 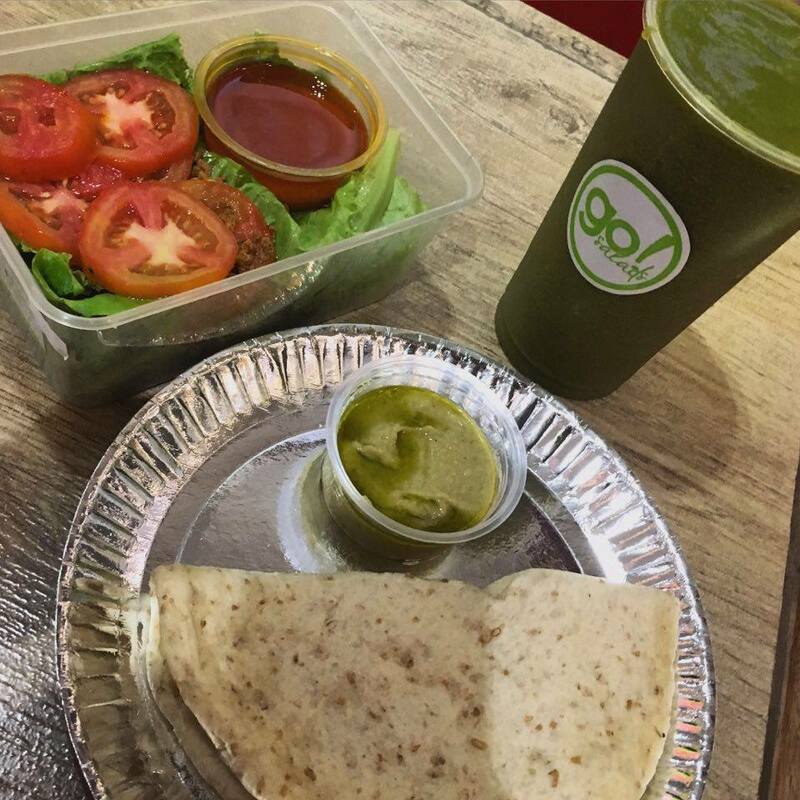 Organic- Vegetables used in Go Salad's products are fresh and organically grown from their farm in Cavite, Nueva Ecija and Nueva Viscaya. They grow the latter without using any chemicals and pesticides that can harm one's health. Eating organic food boost one's immune system and it has more nutrients and vitamins compared to vegetables that grow with pesticides. 3. Good for weight loss- They have snack packs composed of nuts like cashew, trailmix ,walnuts and assorted nuts, and this nuts are among the "Six Best Nuts for Weight Loss" according to Eat This, Not That. Aside from that they also have hummus and pita for snack. Hummus has slow digesting carbs and has lots of fibers that makes you feel full a bit longer than usual and pita bread has lower calories compared with the usual bread in the market. 4. Calorie Counter- This made me hook up with Go Salads. In losing weight, you should always keep track of your calorie intake and it is so hard but thanks to them I can easily check their product's calorie through their calorie counter. 5. Guilt Free Eating- I love eating pastries, cakes, cookies name it! I can actually finish a whole cake if the latter makes my taste buds happy but afterwards I feel guilty, guilty of eating too much sweets and by blowing up my calories (sad) but with Go Salads I can eat my brownies, chocolate and red velvet cup cakes without feeling any guilt. 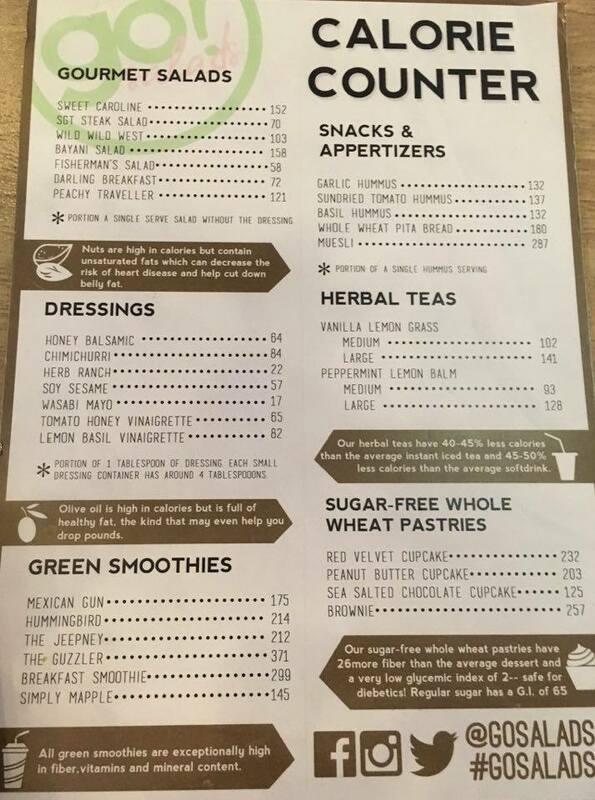 Imagine, their cupcakes and brownies are sugar free and made from whole wheat. A usual brownie's calories would be at around 466 but with Go Salad's it is just 257,that is a huge difference, right? What a great idea on a days when you are too busy to make lunch or just too lazy ;) well, happens to everyone sometimes :) Everything looks so yummy! Sounds amazing! 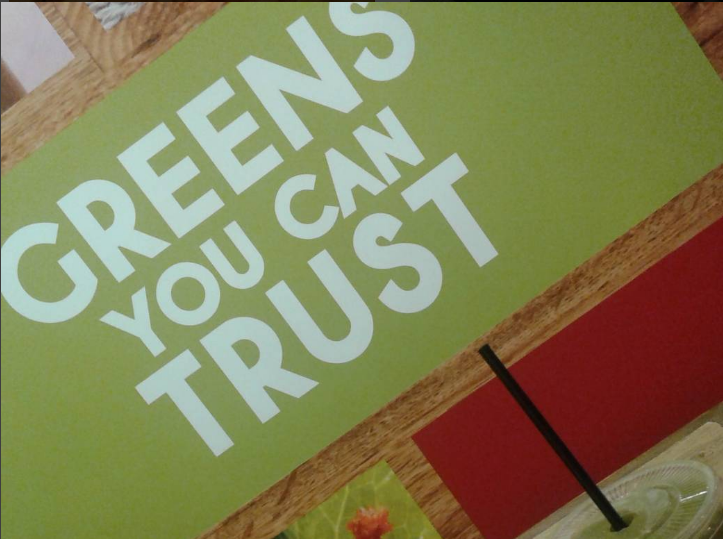 I love that they use organic produce. 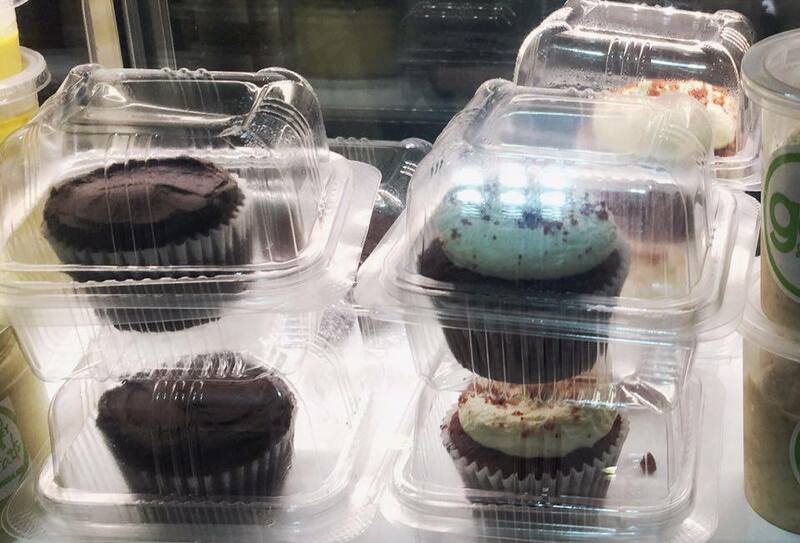 I love those gluten free cupcakes. Salads to go and calorie counted meals are a hit now paired with detox juices. Too bad my place is very far those.. I'm looking for a place near us and the nearest are only Eastwood and Katipunan. Which is still far from Rizal! lol. Even though I'm not so much of a salad eater, I still love veggie and fruit salads! They look delicious and appetizing. I've never been a fan of salad but I'm trying to change my lifestyle so maybe I'll try this one. I recently learned to appreciate and enjoy eating salads, this is very timely to share. They look delish and doesn't hurt that it's organic.